Get your freebies for this year’s Thanksgiving Day! 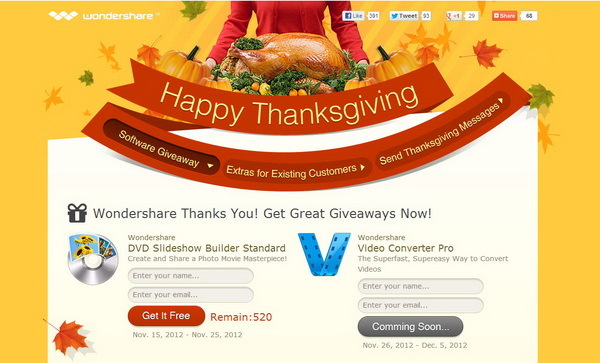 Software maker Wondershare is currently running a great Thanksgiving software giveaway at its website that offers you two of its products for free. The products are DVD Slideshow Builder Standard for Windows and Video Converter Pro for Windows and Mac. The giveaway has already started on November 15 and shall ends on December 5, 2012. Both the software are offered for free in two different time periods – DVD Slideshow Builder Standard for Windows is available from November 15 to November 25 meanwhile comes back on November 25 till December 5 to get Video Converter Pro for Windows and Mac. To grab the free license, simply hop over to the giveaway page. Enter your name and a valid email address into the text boxes, then hit Get it Free button. The free license will arrive at your email inbox together with the direct link to download the setup installer. There are limited license keys though, so make sure you grab it fast.